Summer maximum heat stress trends over the CONUS 1901-2011. Trends in maximum summertime temperature, moisture, and heat index are tracked over three time periods: 1900–2011, 1950–2011, and 1979–2011; these trends differ notably from annual temperature trends. A warming hole in the Midwest generally decreases in size and magnitude when heat stress trends are calculated because the region has increasing moisture. CRU and nearly all reanalyses find cooling in the northern high plains that is not found in NOAA Climate Division (NCD) trends. The research is important because it identifies differences between carefully-constructed long-term datasets (CRUTS3.25 vs CRUT4.01 vs NOAA). Also, most reanalyses poorly capture the temperature trends, though the MERRA-2 and ERA-Interim do the best of the reanalyses tested. The 'warming hole' seen in summer maximum temperatures (over the Midwest, and in a different region for annual temperatures) nearly vanishes when the impact of humidity is included meaning that the impact of the trend is worse than implied by looking only at temperatures. These station-based data monthly were examined: CRUTS3.25, CRUTS4.01, and NCD (Vose et al., 2014). These (sub-daily) reanalyses were examined: North American Regional Reanalysis, MERRA2, ERA-20C, 20CRv2, NCEP/NCAR Reanalysis (1), CFSR, NCEP/DOE AMIP-2, and ERA-Interim. NOAA's Heat Index (HI), and the temperature-humidity index (THI) were calculated from temperature (T) and moisture (q) data. For the reanalyses, fourth order curve fitting was used to estimate the maximum temperature and the moisture at the estimated time of maximum temperature. The trends were calculated for June-August (JJA) mean values of daily mean and daily maximum T, THI, and HI. Annual JJA values were uncorrelated and only the general trends were sought, we computed linear trends using least squares estimation (LSE). The Mann Kendall test was used to determine whether the T, Td, HI, THI, and q consistently increased or decreased over time, i.e. whether the linear trends were significantly different from zero. The differences between some reanalyses were quite large, even opposite in sign, over the more recent time period. This result was quite discouraging and quite unexpected. An apparent error exists in the moisture data provided by CRU. Grotjahn, R, and J Huynh. 2018. 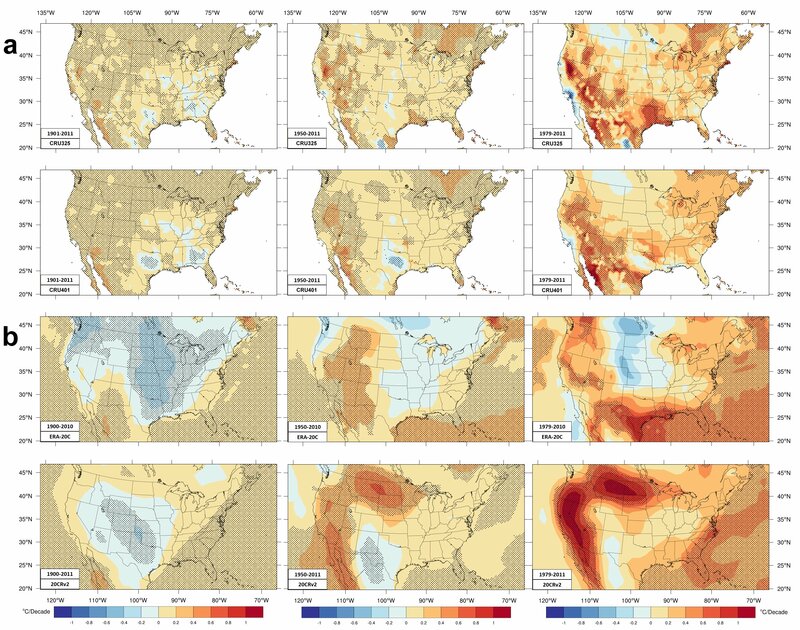 "Contiguous US Summer Maximum Temperature and Heat Stress Trends in CRU and NOAA Climate Division Data Plus Comparisons to Reanalyses." Scientific Reports 8(1): 11146 (1-18), doi:10.1038/s41598-018-29286-w.